A friend from my Dragon Boat Team got a job offer in Switzerland and since she’s no dummy she said yes. This past Sunday there was a going away bbq being held in her honour and lucky for me it started mid afternoon and didn’t end until well after I was done at work so I got to go. Yay! Well, the cake turned out to be a hit! Thank goodness! The pineapple slices weren’t placed very well, my bad, sigh. 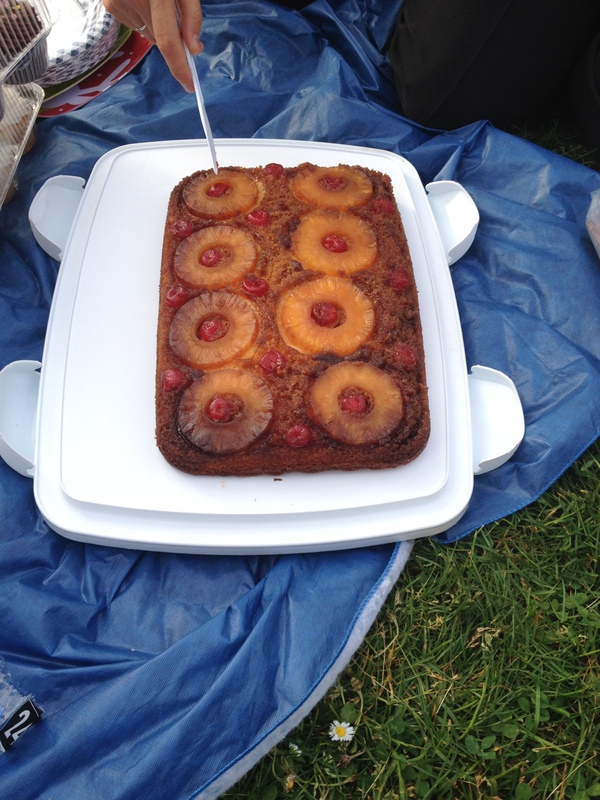 And in the above picture the end of the cake closest to the camera looks darker but it wasn’t burned, honest! It just looks like that in the picture, shrug. Make a basic white cake. Melt 1/4 Cup of butter in the baking pan by putting it in the oven while it is pre-heating to 350F. Once the butter is melted take the pan out and spread the melted butter around, I used a silicone brush to not only spread the butter around the bottom of the pan but also up the sides. Spread 1 Cup of brown sugar on the bottom of the pan, the butter will melt the sugar in to a dark gooey yummy mess. Spread pineapple circles in the bottom of the pan, I bought the smallest can of pineapple circles so I had 8 slices, if you wanted more you could always buy a larger can, cut some of the slices in half and fit in more, up to you! Put a maraschino cherry inside each pineapple circle as well as between them, try not to nibble too many of them because whoa! so addictive lol. Pour the white cake batter on top of the whole shebang. Pop in to the oven for 42-48 minutes. Once the cake is done immediately run a knife around the edges, you’ll notice the cake comes away from the side super easily. Place a heatproof serving plate upside down on to the pan and flip the plate and pan over together. Try to center it when you do that because the cake doesn’t like to be moved which is why mine is nowhere near centered on my cake platter, oops! Leave the pan over the cake for 5 minutes or so, allowing the brown sugar topping to drizzle on to the cake, Mmm! When making the white cake use the pineapple juice from the can, however much liquid your white cake recipe calls for, measure out the pineapple juice first then top it up with water, or milk or oil or whatever your recipe uses. You’ll infuse the cake with pineapple flavour, making the whole thing just that much better. If you are using a glass pan heat oven to 350F and bake for 42-48 minutes. If you are using a dark or nonstick pan heat oven to 325F and bake for 44-53 minutes.